Reading and share top 43 famous quotes and sayings about Precepts by famous authors and people. Browse top 43 famous quotes and sayings about Precepts by most favorite authors. 1. "The Bible is proved to be a revelation from God, by the reasonableness and holiness of its precepts; all its commands, exhortations, and promises having the most direct tendency to make men wise, holy, and happy in themselves, and useful to one another." 2. "Society conspires against her from early infancy. Her brain is steadily filled with plaster until it sets: ‘If you're not married by the time you're twenty-five, you'll have good reason to be ashamed'; ‘if you laugh, you won't look dignified' ; ‘if your face betrays your feelings, you'll look coarse'; ‘if you mention the existence of a single body hair, you're repulsive' ; ‘if a boy kisses you on the cheek in public, you're a whore'; if you enjoy eating, you're a pig'; ‘if you take pleasure in sleeping, you're no better than a cow'; and so on.These precepts would be merely anecdotal if they weren't taken so much to heart." 3. "My family, frankly, they weren't folks who went to church every week. My mother was one of the most spiritual people I knew but she didn't raise me in the church, so I came to my Christian faith later in life and it was because the precepts of Jesus Christ spoke to me in terms of the kind of life that I would want to lead." 4. "How many observe Christ's birthday! How few, His precepts!" 5. "And even those who claim to read the Bible literally and to lead their lives according to its precepts are, in actual practice, highly selective about which parts of the Bible they live by and which they don't. Jesus' condemnations of wealth and war are generally ignored; so are Levitical prohibitions on eating pork, wearing mixed fabrics and so forth. Though legalistic Christians accuse nonlegalistic Christians of selective interpretation and relativistic morality (of adjusting the Bible, in short, to suit their own lifestyles and prejudices), what is usually happening is that nonlegalists are, as the Baptist tradition puts it, reading the Bible with Jesus as their criterion, while the legalists are, without any philosophical consistency whatsoever, embracing those laws and doctrines that affirm their own predilections and prejudices and ignoring the rest." 6. "When we refuse to work with our disappointment, we break the Precepts: rather than experience the disappointment, we resort to anger, greed, gossip, criticism. Yet it's the moment of being that disappointment which is fruitful; and, if we are not willing to do that, at least we should notice that we are not willing. The moment of disappointment in life is an incomparable gift that we receive many times a day if we're alert. This gift is always present in anyone's life, that moment when 'It's not the way I want it!" 7. "But we do believe in religion—at least for other people. It is a means ofmarketing hope, and of instilling ethical precepts on the cheap. It is also a form of discipline." 8. "It's probably not just by chance that I'm alone. 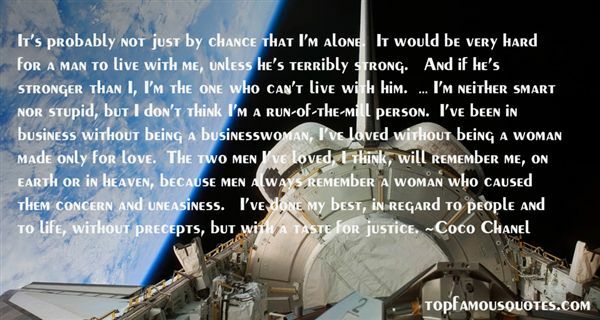 It would be very hard for a man to live with me, unless he's terribly strong. And if he's stronger than I, I'm the one who can't live with him. … I'm neither smart nor stupid, but I don't think I'm a run-of-the-mill person. I've been in business without being a businesswoman, I've loved without being a woman made only for love. The two men I've loved, I think, will remember me, on earth or in heaven, because men always remember a woman who caused them concern and uneasiness. I've done my best, in regard to people and to life, without precepts, but with a taste for justice." 9. "I am human because God made me. I experience suffering and temptation because mankind chose to follow Satan. God is reaching out to me to rescue me. I am learning to trust Him, learning to live by His precepts that I might be preserved." 10. "We learn this by the precepts that Jesus left. He observed that the people were looking outward, and assured them that the kingdom of God cometh not with outward observation; and for this reason, that it was only to be known in man." 11. "Belief must be something different from a mixture of opinions about God and the world, and of precepts for one life or for two. Piety cannot be an instinct craving for a mess of metaphysical and ethical crumbs." 12. "Charming women can true converts make, We love the precepts for the teacher's sake." 13. "But this isn't their God, she decided. It's my God. This is a God I have found through sacrificing my own life, through my flesh being cut, my skin ripped off, my blood sucked away, my nails torn, all my time and hopes and memories being stolen from me. This is not a God with a form. No white clothes, no long beard. This god has no doctrine, no scripture, no precepts. No reward, no punishment. This God doesn't give, and doesn't take away. There is no heaven up in the sky, no hell down below. When it's hot, and when it's cold, God is simply there." 14. "Trees are sanctuaries. Whoever knows how to speak to them, whoever knows how to listen to them, can learn the truth. They do not preach learning and precepts, they preach, undeterred by particulars, the ancient law of life." 15. "Was that all her religious beliefs had ever been then, a set of precepts so deeply inculcated in her that they became automatic, even instinctive? Hear the word God, think He. See the misery of humankind, blame Eve. Obey your parents, be a good girl, vote Trinity Party, never sit with your legs apart. Don't question, just do as you're told." 16. "In these centuries when God,...was forging a Christian church so that it might fulfill the longing of a hungry world, He was at the same time perfecting His first religion, Judaism, so that it might stand as the permanent norm against which to judge all others. Whenever, in the future some new religion strayed too far from the basic precepts of Judaism, God could be assured that it was in error; so in the Galilee, His ancient cauldron of faith, he spent as much time upon the old Jews as He did upon the new Christians." 17. "Addison writes with the ease of a gentleman. His readers fancy that a wise and accomplished companion is talking to them; so that ... - MORE Addison writes with the ease of a gentleman. His readers fancy that a wise and accomplished companion is talking to them; so that he insinuates his sentiments and taste into their minds by an imperceptible influence. Johnson writes like a teacher. He dictates to his readers as if from an academical chair. They attend with awe and admiration; and his precepts are impressed upon them by his commanding eloquence. Addison's style, like a light wine, pleases everybody from the first. Johnson's, like a liquor of more body, seems too strong at first, but, by degrees, is highly relished." 18. "His OFELLUS in the Art of Living in London, I have heard him relate, was an Irish painter, whom he knew at Birmingham, and who had practiced his own precepts of economy for several years in the British capital. He assured Johnson, who, I suppose, was then meditating to try his fortune in London, but was apprehensive of the expence, 'that thirty pounds a year was enough to enable a man to live there without being contemptible. He allowed ten pounds for cloaths and linen. He said a man might live in a garret at eighteen-pence a week; few people would inquire where he lodged; and if they did, it was easy to say, "Sir, I am to be found at such a place." By spending three-pence in a coffee-house, he might be for some hours every day in very good company; he might dine for six-pence, breakfast on bread and milk for a penny, and do without supper. On clean-shirt day he went abroad, and paid visits." 19. "I was always exceedingly delighted with that saying of Chrysostom, "The foundation of our philosophy is humility"; and yet more pleased with that of Augustine: "As the orator, when asked, What is the first precept in eloquence? answered, Delivery: What is the second? Delivery: What is the third? Delivery: so if you ask me concerning the precepts of the Christian religion, I will answer, first, second, and third, Humility." 20. "When obedience to the Divine precepts keeps pace with knowledge, in the mind of any man, that man is a Christian; and when the fruits of Christianity are produced, that man is a disciple of our blessed Lord, let his profession of religion be what it may." 21. "I told the brethren that the Book of Mormon was the most correct of any book on earth, and the keystone of our religion, and a man would get nearer to God by abiding by its precepts, than by any other book." 22. "Lenin refused to recognise moral norms established by slave-owners for their slaves and never observed by the slave-owners themselves; he called upon the Proletariat to extend the class struggle into the moral sphere too. Who fawns before the precepts established by the enemy will never vanquish that enemy!" 23. "These men seem not to know that poetry has its particular rules and precepts; and that history is governed by others directly opposite." 24. "Mysteries are the evidence to errors in our religious and historical precepts." 25. "The precepts "Love your enemies, do good to them which hate you, bless them that curse you" ... are born from the Gospel's profound spirit of individualism, which refuses to let one's own actions and conduct depend in any way on somebody else's acts. The Christian refuses to let his acts be mere reactions—such conduct would lower him to the level of his enemy. The act is to grow organically from the person, "as the fruit from the tree." ... What the Gospel demands is not a reaction which is the reverse of the natural reaction, as if it said: "Because he strikes you on the cheek, tend the other"—but a rejection of all reactive activity, of any participation in common and average ways of acting and standards of judgment." 26. "To write out the precepts again, we contend with them, and keep them; we build our humanity, and keep our humanity alive... Thay has named the precepts 'wonderful'... Wonderful because they can protect us, and show us how to live a joyous life, an interesting, adventurous, deep, large life, and how to be with one another, and with animals, plants, and all the Earth and universe. Wonderful because when we practice the precepts, we existentially become humane, we embody loving kindness... Standing in the midst of burning ruins, I was glad that I knew the precepts. Though I kept their tenets imperfectly, even in aspiration I created some invisible good that could not be destroyed... The Five Wonderful Precepts give clear and simple directions to finding that life. In devastation, I have blueprints for making home anew (90-92).--For a Future to Be Possible: Commentaries on the Five Wonderful Precepts"
27. "Economists want their discipline to be a science, and they have nailed down a few precepts, but many of their debates are still clouded by ideology." 28. "She replied that it was precisely men well versed in religion who beat their wives. The precepts of religion permitted such punishment. A virtuous woman was not supposed to complain about her husband. Her duty was perfect obedience." 29. "All the miseries and evils which men suffer from vice, crime, ambition, injustice, oppression, slavery and war, proceed from their despising or neglecting the precepts contained in the Bible." 30. "In the earliest times of the discovery of the faculty of judgment, every new judgment was a find. The worth of this find rose, the more practical and fertile the judgment was. Verdicts which now seem to us very common then still demanded an unusual level of intellectual life. One had to bring genius and acuity together in order to find new relations using the new tool. Its application to the most characteristic, interesting, and general aspects of humanity necessarily aroused exceptional admiration and drew the attention of all good minds to itself. In this way those bodies of proverbial sayings came into being that have been valued so highly at all times and among all peoples. It would easily be possible for the discoveries of genius we make today to meet with a similar fate in the course of time. There could easily come a time when all that would be as common as moral precepts are now, and new, more sublime discoveries would occupy the restless spirit of men." 31. "13. A Buddha In Tokyo in th Meiji era there lived two prominent teachers of opposite characteristics. One, Unsho, an instructor in Shingon, kept Buddha's precepts scrupulously. He never drank intoxicants, nor did he eat after eleven o'clock in the morning. The other teacher, Tanzan, a professor of philosophy at the Imperial University, never observed the precepts. When he felt like eating he ate, and when he felt like sleeping in the daytime he slept. One da Unsho visited Tanzan, who was drinking wine at the time, not even a drop of which is supposed to touch the tongue of a Buddhist. "Hello, brother," Tanzan greeted him. "Won't you have a drink?" "I never drink!" exclaimed Unsho solemnly. "One who never drinks is not even human," said Tanzan. "Do you mean to call me inhuman just because I do not indulge in intoxicating liquids!" exclaimed Unsho in anger. "Then if I am not human, wht am I?" "A Buddha," answered Tanzan." 32. "That book is true... I wrote it myself as it fell from the lips of the prophet. It contains the everlasting gospel, and comes in fulfillment of the revelations of John where it says he saw an angel come with the everlasting gospel to preach to every nation, tongue and people. It contains principles of salvation. And if you will walk by its light and obey its precepts you will be saved in the everlasting kingdom of God." 33. "All stories teach, whether the storyteller intends them to or not. They teach the world we create. They teach the morality we live by. They teach it much more effectively than moral precepts and instructions." 34. "Drizzt Do'Urden had followed a line of precepts based upon discipline and ultimate optimism. He fought for a better world because he believed that a better world could and would be made. He had never held any illusions that he would change the world, of course, or even a substantial portion of it, but he always held strongly that fighting to better just his own little pocket of the world was a worthwhile cause." 35. "There is no right and wrong, and precepts are for fools. Every thing is just as it is! And we must experience things without condemning them, because if we condemn them, then we are becoming too involved." 36. "...it would be an undoubted advantage if we were to leave God out altogether and honestly admit the purely human origin of all the regulations and precepts of civilization. Along with their pretended sanctity, these commandments and laws would lose their rigidity and unchangeableness as well. People could understand that they are made, not so much to rule them as, on the contrary, to serve their interests; and they would adopt a more friendly attitude to them, and instead of aiming at their abolition, would aim only at their improvement." 37. "...churchgoing is not synonymous with personal spirituality. There are some people who get so busy in church worship and projects that they become insensitive to the pressing human needs that sourround them, contradicting the very precepts they profess to believe deeply." 38. "On the ethics of war the Quran and the New Testament are worlds apart. Whereas Jesus tells us to turn the other cheek, the Quran tells us, 'Whoso commits aggression against you, do you commit aggression against him' (2:194). The New Testament says nothing about how to wage war. The Quran, by contrast, is filled with just-war precepts. Here war is allowed in self-defense (2:190; 22:39), but hell is the punishment for killing other Muslims (4:93), and the execution of prisoners of war is explicitly condemned (47:4). Whether in the abstract is is better to rely on a scripture that regulates war or a scripture that hopes war away is an open question, but no Muslim-majority country has yet dropped an atomic bomb in war." 39. "All Rehab actually wanted was to belong to the Lord. She thirsted for God. Hungered for Him. She couln't seem to get enough of His precepts. And what she was searching for wasn't knowledge. It was belonging. She wanted the Lord Himself." 40. "Let one mold himself in accordance with the precepts he teachers." 41. "The whole function of the life of prayer is, then, to enlighten and strengthen our conscience so that it not only knows and perceives the outward, written precepts of the moral and divine laws, but above all lives God's law in concrete reality by perfect and continual union with His will." 42. "The merciful precepts of Christ will at last suffuse the Code and it will glow with their radiance. Crime will be considered an illness with its own doctors to replace your judges and its hospitals to replace your prisons. Liberty shall be equated with health. Ointments and oil shall be applied to limbs that were once shackled and branded. Infirmities that once were scourged with anger shall now be bathed with love. The cross in place of the gallows: sublime and yet so simple." 43. "In all the antique religions, mythology takes the place of dogma; that is, the sacred lore of priests and people... and these stories afford the only explanation that is offered of the precepts of religion and the prescribed rules of ritual." Mammograms are really sort of a gift. You can either catch something early or count your lucky stars because nothing was discovered. Either way, you're ahead of the game."